First, everybody at Bigfoot Lunch Club would like to acknowledge those who have bravely made the greatest sacrifice for our country. Thank you and your service will never be forgotten. 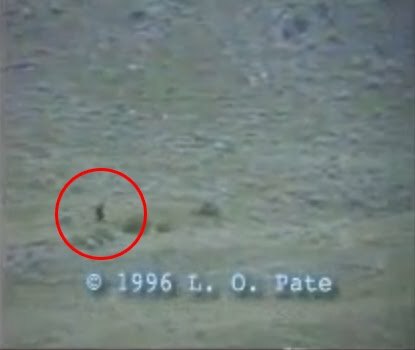 14 years ago on Memorial day, the Bigfoot community had a new video to reflect upon and perhaps scrutinize. It is known as--wait for it--The Memorial day Bigfoot video. The Memorial Day video is a Hi-8mm video that is purported to show a Bigfoot. It was videotaped on May 26, 1996, by Lori Pate while they were on a fishing trip with family and friends at Chopaka Lake, in Okanogan County, Washington. It was preceded by two sightings of an ape-like, hair covered figure at lesser distances by others on the trip. It shows a figure, matching the description of Bigfoot, running across a hill. It disappears behind a less inclined sloped area, then reappears briefly, walking this time, before going into the trees on the right side of the frame. In Exhibit 8 of the documentary Sasquatch: Legend Meets Science, the location where the film was taken is used to make forensic measurements to determine the film subject's height, path, speed, and stride by measuring the subject against fixed objects in the background. Derek Prior, a three-time All-American sprinter from the University of Washington, runs the same route as the figure to determine if the alleged Bigfoot's running speed was too fast for a human to duplicate, to compare his speed and stride to the subject's, and to give a visual comparison to the figure in the footage. Derek Prior, on the other hand, was able to run the same path at 17.1 mph (27.51 km/h) and had a stride of 6.8 ft (2.07 m). However, one aspect of the film remained a mystery. At the end, before the subject goes into the trees, it appears to grow taller by 8 inches (20.32 cm). One possible explanation is that if it was indeed a real animal, it could be carrying a younger animal that had climbed higher on its back.